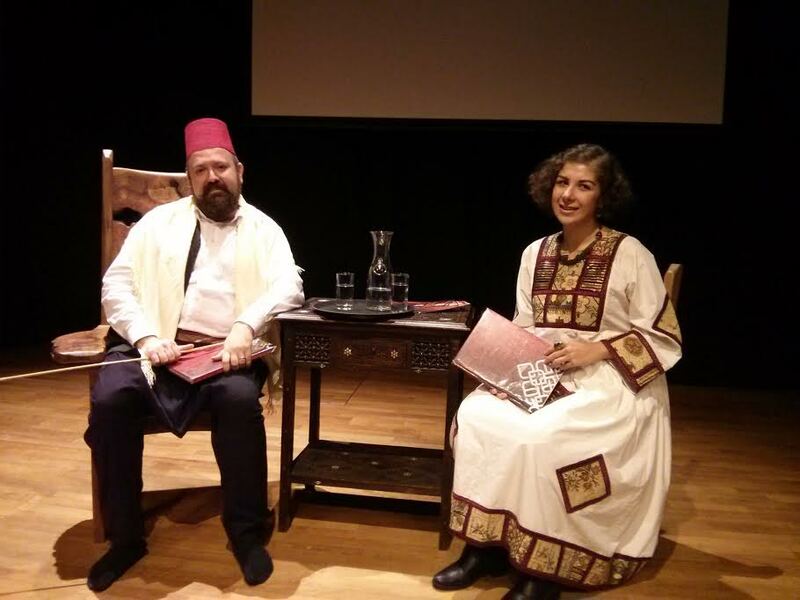 The show was based on a very simple but evocative scene of a Syrian storyteller, or hakawati. A traditional big carved chair, a big book, an equally big hat, and a wee stick for chiding any sleepy listeners back to full attention. We glimpsed one of the few smiles that came from Bassam Dawood the storyteller or hakawati’s lips as he lifted his stick, but then continued with his sad story, translated piece by piece from Arabic into English by Dima Mekdad, who sat in the other carved chair in an old-fashioned embroidered peasant gown; the story of a musician’s journey out of Syria, accompanied by a single guitarist in the near corner of the stage. A simple, short film of the ocean’s waves, made by visual artist Juan Delgado, set the atmosphere for a brave journey into the unknown. Because of the set, I was expecting to hear a traditional story or two, but they used the vehicle of traditional story telling to bring to life a true story of a young refugee musician and his equally young lover, Amina, making a harrowing journey across Europe to escape from the war in Syria. I had a personal interest in this show, having grown up with the family legend of my Syrian great-grandparents eloping to Beirut as teenagers and having a tough and eventful journey of their own; spanning continents, escaping civil wars and having children kidnapped along the way. The wee theatre is very comfortable and warm, and allows you to settle in, almost as if you are at home. The audience spanned all age groups, and seemed to be a mixture of Scottish and Middle Eastern for the most part. Some of the audience were very obviously moved by the story, and judging by their knowing nods during the Arabic parts of the story, you wondered if they too were Syrian, and what trials they and their friends and family may have also been through. Both of the perfomers are Syrian ex-pats, Bassam living in Berlin and Dima in London, and I wished I could have stayed for the post-show discussion in the cafe to find out more about both their own journeys and the project as a whole. There were many dramatic moments in the story; particularly when Amina goes missing in the forest, and when the musician swims his way from Turkey to Greece to reunite with his lost love. The story was so touchingly personal, but I was struck how the enduring themes of human existence continue to play out across the world, as if we can never learn to do better; callousness and greed allowing us to ignore the suffering of others, yet the power of enduring love and the determination to survive in seemingly impossible circumstances shows us how noble we can be. 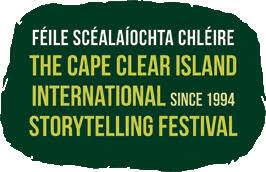 I also found myself feeling sad that the art of live storytelling is on the wane right across the world. They explained that in former times the storyteller would hold court on a Thursday evening, as the weekend began, and would continue the story every week, just like our modern TV soap operas. There should be more stories like these being broadcast in all sorts of ways, to share stories and humanise the realities of being in the situation of a refugee, people fleeing war and suffering, people who don’t want to leave their family and friends and everything they’ve ever known, including ‘their ground that was theirs’ to risk their lives to reach hostile and cold lands. Many such stories have been collected and translated and can be found on www.talkingsyria.com for those who wish to find out more. Rita Dove : How Does the Shadow Shine?